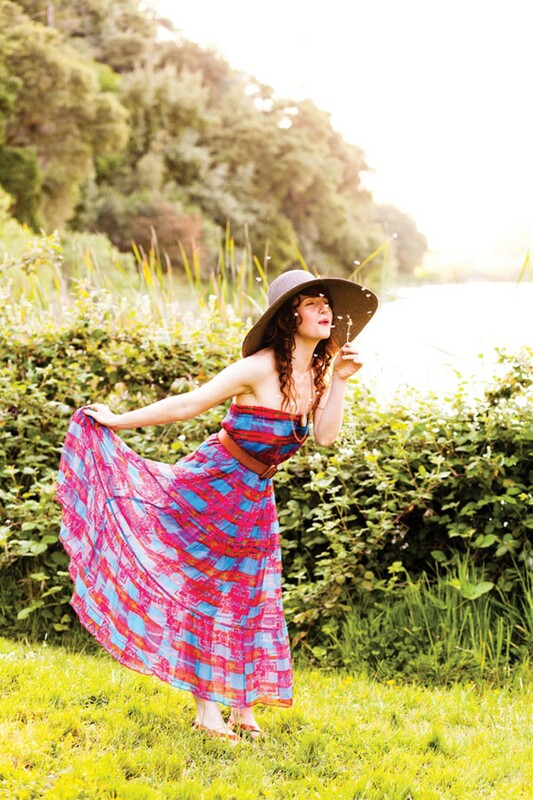 This summer, try a maxi dress paired with a wide-brimmed hat. Styled by Rare Bird. By now we all know that the sun's rays can damage your skin. While sunglasses (especially the bug-eyed variety) have been the preferred sun-deflecting accessory for years now, hats are making a welcome comeback. Whether you're headed to the beach, a picnic, or the garden, a wide-brimmed hat serves both style and function. It was definitely the accessory du jour at the recent Coachella Music Festival. Get yours at the Berkeley Hat Company (2510 Telegraph Ave., Berkeley, BerkeleyHat.com), which offers a wide variety of sun hats for men and women, no matter if you thrive on frills or simplicity. The former look has become especially popular because of the Royal wedding. If you're itching to make a similarly loud statement with your topper, tone down the rest of your ensemble to keep a fashionable balance. No matter what style you choose, make sure your hat fits correctly, with a little bit of room between your head and the hat. Men have a decidedly slimmer selection when it comes to hat fashion for the summer. Over the last couple of years, the tried-and-true baseball cap has had a makeover. Instead of looking as if you've come straight from the bullpen, fitted caps with straight brims are what's hot. Because of its tailored fit, these caps bring a crisper, cleaner look to your ensemble. Find one at Upper Playground (2509 Telegraph Ave., Berkeley, 510-649-0740, Shop.upperplayground.com), which has a great selection of hats with an emphasis on Bay Area pride. Women can also style a sporty outfit around a fitted baseball hat, but the extent of unisex hats should end there. This means no fedoras. For far too long we have had to endure the sight of every single type of fedora imaginable — wicker, denim, pinstripe, et al — and the result never changes: They don't look good. If you're looking for a smaller hat, why not try a panama instead? When you look back on your old Facebook photos, you'll be glad you did. Beachwear will always consist of bikinis, but in the city it's all about breathable and flowing garments. San Francisco's fan favorite used clothing store Painted Bird (1360 Valencia St., PaintedBird.org) is the perfect place to pick up classic pieces to add to your warm weather collection. Choose from any one of the adorable loose button-ups to match with khaki or jean shorts for a clean picnic look, or pair it with a circle skirt to beat the heat in the office. For men, the store's oxford and western-style shirts are a timely update to polos and T-shirts. This summer, everything from separates to "coveralls" are in style — including sundresses, maxi dresses, rompers, jumpsuits, and even overalls. No matter which style you don, there are particular patterns and color palettes that are popular. The time-tested favorite is nautical stripes and colors. Whether you're a yacht enthusiast, a first mate, or a wannabe pirate, the combination of white, navy, and red screams summer fun with a hint of class. Over the last couple of years, floral patterns have made their way out of the Nineties and back into the spotlight. While both small and large patterns are in style, it's important not to overdo it. If neither of those tickle your fancy, bright bold colors such as hot pink, teal, canary yellow, and orange are the perfect way to integrate some pop into your life. Just be sure that you don't go overboard with the intensity of your colors. No one wants to look like a highlighter exploded on them. Thanks in part to the stunning costumes from the Coen Brothers' True Grit — not to mention their impeccable durability — western-style frontier accessories have quickly become the must-have items of the season. If you get anything, invest in a leather satchel purse. Oakland clothing and accessories gem Rare Bird (3883 Piedmont Ave., Oakland, TheRareBird.com) has an incredible collection of purses and bags to fit any desired look with the durability of a lifetime. While browsing around Rare Bird, be sure to check out their gorgeous jewelry full of artful whimsy, much of which is locally designed. Their long necklaces and dangling earrings evoke the effortless cool that was so iconic of the Summer of Love. When all is said and done, you should love your clothes regardless of the ever-changing and cycling fads. The best rule of thumb is to wear what makes you feel comfortable and beautiful; after all, classic styles will always be relevant. To quote my grandmother, nothing stays in style as much as a nice button-up shirt and a well-fitting skirt or pair of slacks. Happy shopping!